Last Tuesday my partner Tom and I left NYC to embark on a road trip to Florida. Along the way we made lots of stops. One of my favorite places so far was Savannah, Georgia. The city is just beautiful with Spanish moss hanging from trees everywhere and quaint looking homes. I could picture myself living there. One of the most adventerous places we visited was Juniper Springs Park in Ocala, Florida. We rented a canoe and paddled 7 miles along a narrow river surrounded with lush vegetation and overhanging trees that required us to duck on many occassions. At one point we paddled by an alligator that growled at us! 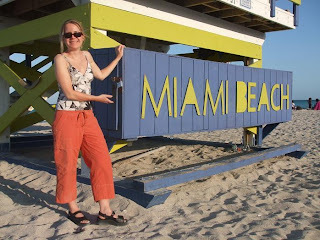 Well, yesterday we arrived in Miami Beach! We spent the entire day walking along the beach and exploring the area. The ocean is absolutely beautiful here. Today we plan to visit the Florida Everglades. When I return from my trip I'll post lots of photos and I'll even have a giveaway. Stay tuned! Sounds fun! Especially the canoe ride. Looks like you have a great time, have fun! Souvenirs from a Road Trip Giveaway!